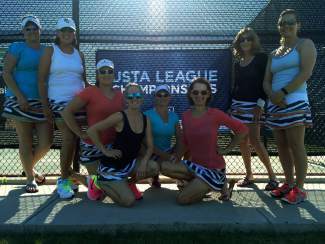 Our Homestead 3.0 Tennis Team won districts and represented the Mountain League in Denver. We rock! Pictured are Jill Moneypenny, Terry Mutter, Susanna Chlipala, Lauren Grayson Voboril, Shannon Fedrizzi, Netia Gerken, Susan Chipman and Rose Braden. Not pictured are Hatsie Hinman, Helen Ziuelonghi, Kaia Moritz and Shelly Jarnot.